Paul S. Kemp is one of my favorite authors, his ability to draw me into a story is unparalleled. As the title and cover state, this book is about the Lords of the Sith, Palpatine and Vader. I tend to romanticize Vader a bit in the sense that he is a fallen hero destined for redemption and the one to bring balance to the force, but Kemp reminds us that that person is not here yet and regardless of our knowledge of Anakin/Vader’s destiny, he is a villain. Actually, he is more than just a villain, he is a monster. There is a scene at the beginning of the book that send shills up my spine. Vader is chasing a group of rebels but instead of engaging them in ship to ship combat he wants to get up close and personal. I won’t give away any spoilers, but he gains access to the rebels’ ship and takes a comlink. All that can be heard is the sound of his respirator, and then he says, “I’m coming for you now.” <goosebumps> But if Vader is a monster then Palpatine is something all together worse. We get a peek at just how powerful the Emperor is. So much so, that is makes his battle with Yoda in Revenge of the Sith look like a simple sparring match. I enjoyed every minute of this book and I hope we see more Vader/Palpatine stories by Paul. He has captured their collective voices perfectly. 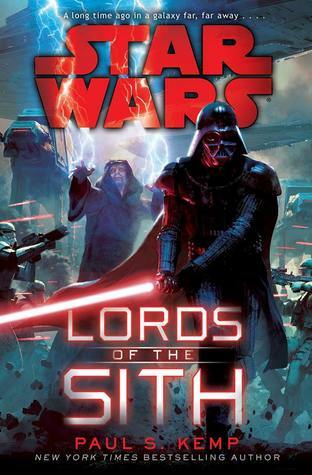 Lords of the Sith will be available on April 28, 2015. I received an eARC from the publisher through Netgalley in return for an honest review. Posted in Book Review, New Releases, Star Wars.